I've been planning on making Roman shades for the living room for a long time. When we moved into the house, we bought some cheap tab curtains at Target to cover up the windows until we figured out somethinmg different. Two years later, I got around to figuring out something different. I've taken the week off in order to clear my head from work, and my mom was coming up to visit, so this seemed like the ideal time to start on the project. I special-ordered fabric from JoAnn, taking advantage of their half-off sale on decorator fabric. I also ordered all the hardware I needed and personalized step-by-step directions for my window measurements from Make-Roman-Shades.com, which was very helpful. The hard part of the project turned out to be not the sewing, but mounting the shades in the windows. Here's how things went. Monday, 10 am. Cut mounting boards from scrap 1x2 lumber left over from the basement project, feeling very virtuous. Discover that 50 year old 1x2's are actuall 2 inches wide, and therefore too wide for my inside-mount space. Monday, 2 pm. Go to Menards for "modern" 1x2's, which are actually 1.5 inches wide. Monday, 4 pm. All supplies bought, start cutting fabric and sewing. Marvel at how helpful instructions are. Break for dinner. Monday, 8 pm. Produce one finished shade, and attach to 1x2 mounting board. Craig holds it up in the hallway and we ooh and aah at how nicely it works. Have a glass of wine in premature celebration and retire for the night. Tuesday, 8 am. Hang first shade. Wonder why it gaps so much at the side. Unmount the shade and adjust fabric's position on Velcro. Observe that it still gaps a lot. Realize that "modern" 1x2's are still too wide. Engage in circular saw gymnastics in order to trim a new section of mounting board down to 1x1. Unscrew hardware and replace on the new mounting board. Tuesday, 8 am - noon. Mom slowly goes crazy trying to match plaids for the large section of the picture window. This section measures 56 inches, while the fabric is 54 inches wide. We elect to do one big seam down the middle, which ends up looking good, but causes a lot of grief. Tuesday, 11 am. New mounting board won't match up with previously drilled pilot holes. Drill new pilot holes. Hang shade. Realize that screws are going into old pilot holes. Get Mom to squeeze underneath the shade with me and hold shade in place as I put the screws in. ONE SHADE SUCCESSFULLY HUNG! Tuesday, noon. Break for lunch. Return home, and enter The Zone. Cut remaining mounting boards to size, sew tapes on big picture window shade, string shades as they get done, and hang shades as they get done. The Zone is interrupted only by drill bits breaking as I try to drill pilot holes at a steady angle into hard oak woodwork. This makes heat, and drill bits don't like heat. By 6:00, though, the picture window is completely shaded. We break for dinner. Tuesday, 9 pm. Hang last shade, in the side window. Too tired for wine. Go to bed. Despite all the headaches, things went pretty smoothly once we figured things out and got a good system going. I feel like I could do Roman shades for every other room in the house without too much difficulty. (I probably have enough leftover fabric to get halfway there, too.) 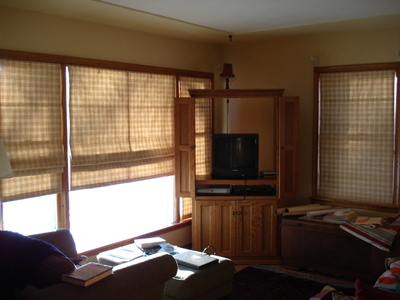 The next step is some sort of valances in the living room, though, to soften the square lines of the shades. I was very pleased on Wednesday morning to sit in my chair and enjoy the sun coming in, without it blinding me. Please excuse the mess. 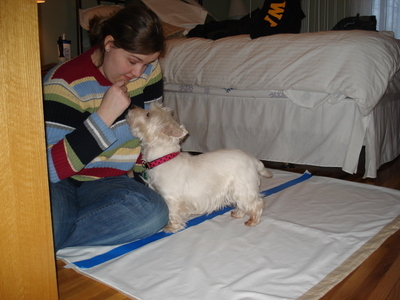 Phoebe was such a good helper as I attached the roman shade tapes to the big shade. She would walk up on the fabric, then lie down right where I needed to be working. We WILL get it done by Tuesday night. We WILL. My sister and I made roman shades this spring....we have yet to finish - it was a complete nightmare. 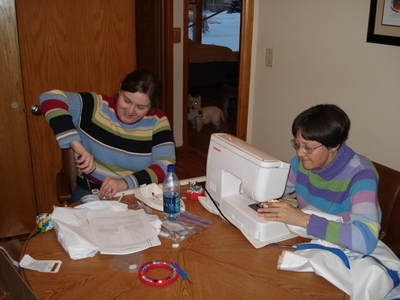 But, not because of our sewing skills - we had the worst sewing directions of all time. It was like reading chinese or something. It took us one weekend to get it done and I assure you - the only reason we got the shade done is because we made up our own directions! It looks gorgeous - but never again! Maybe you can hook us up with your directions.